The Girly Blog | insideWYNTER: Fantasy can be reality! Also, tell me if you'd want to see a video tutorial on this look ! blue+purple is one of my favorite color combos! What other products do you have on? jajaja!!! Love the pictures and the eyes are DRAMA..LOVE IT. You are so cute Shanice!!! This is a fun look! 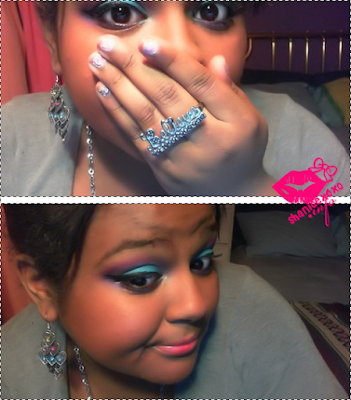 I love the colour of your eyeshadow let alone the ring. Cute photos. Thanks for sharing and feel free to drop by me too, soon. What a cool dramatic eyes! well done. Love the blog Shanice! I'm definitely following! You're adorable! Love the colours and your cute expressions!